Often referred to as 'the last of the square riggers' the Rover TF gained this title due to its very strong resemblance to the pre-war Midgets. Originally launched at the 1953 Motor Show the TF was greeted with mixed reactions from enthusiasts and journalists alike. It was no secret that the TF was a stop gap measure due to a delay in putting the long awaited MGA into production. This was due entirely to Leonard Lord, the BMC Managing Director who favoured the proposal put forward by Donald Healey for his Healey 100. Healey had pipped the Abingdon men by several days which resulted in the long awaited MGA project being put on hold for at least a couple of years. Lord considered that the MGA and Healey were so similar and it was for this reason that the TF became part of MG history. Many considered that the TF was simply a revamped TD, one scathing journalist even reported that it “looked like a TD with the front pushed in". To the Abingdon engineers, led by Cecil Cousins, it was a model that was sufficiently different from its predecessors and yet continued the traditional T series classic lines. The TF was introduced at a time when other manufacturers were producing very sleek and streamlined models. The aforementioned Healey although from the same camp was seen as a direct competitor and Triumph with their TR2 were viewed in the same light. 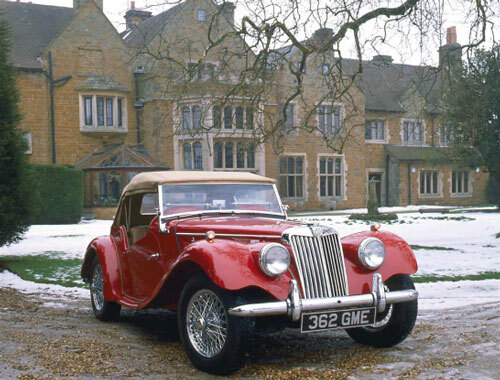 Other makes that MG had to compete with at that time were Morgan, Porsche, AC and Jaguar with their stunning XK 120. Many motoring journalists thought that the TF would be a non-starter, particularly with such a varied sports car selection available to prospective purchasers. However, even in the light of this stiff competition and the fact that the TF was only intended as a stop gap measure, sales of the two TF versions, 1250 cc and 1500 cc totalled 9,600 in 19 months which was a creditable achievement. The prototype TF was produced in true Abingdon style being put together in just a few weeks by Cecil Cousins and his team. Based on a TD chassis the prototype was built up without any reference to plans and was swiftly approved by BMC before proper working drawings were undertaken in May 1953. By September of that year the TF was put into full production. Essentially the TF was based on the same chassis and mechanical components as the TD Mark II. The centre section of the body shell remained virtually the same as that of the TD. The most significant change was to adopt a sloping radiator grille that for the first time concealed a separate radiator. The bonnet also had a marked forward slope achieved by lowering the radiator shell by three and a half inches in relation to the scuttle top. The front wings were also restyled to accommodate faired in headlamps instead of the traditional bolt on fixings on the wing stays as on the TD. The wings in turn were faired into the bonnet sides which all in all helped to create a new streamlined image. The rear of the car received some general restyling with modifications to the fuel tank and spare wheel mounting to help tidy up the overall appearance of the car. The end result was a car very pleasing to the eye but still a little dated compared to the offerings of other manufacturers of the era. Interior wise and in keeping with the external modifications the cockpit layout was quite radically changed to that of its predecessor. A combination of items taken from the Y series saloons, the TD and some items exclusive to the TF formed a comfortable and pleasant cockpit. Individual adjustable seats were provided in place of the normal bench type seating. The facia panel was completely new with a welcome return to octagonal instrumentation. This was positioned centrally to allow easy construction of either a left or right hand drive model, many customers complained however that the rev counter was too far away for easy reading. Despite being advanced over its predecessors with many innovative additions, there was still no fuel gauge which surprised many would be purchasers. Otherwise the instrumentation was quite comprehensive with an oil pressure gauge, temperature gauge, ammeter and clock. One other source of irritation was the fact that the bonnet sides were fixed and only the top of the bonnet could be hinged up to work on the engine. This made some normally easy jobs quite difficult and tedious. Initially the car was launched with the faithful 1250 cc XPAG engine that made its debut in the TB Midget back in 1939. Many enthusiasts were disappointed with this as they had hoped for more power, particularly as the Triumph TR2 was capable of over 100 mph compared to the 'flat out' 80 mph achievable with the TF. Mechanically the car proved most reliable and also felt very good to drive with impeccable roadholding and handling, however the car was embarrassingly slow compared to its competitors both in acceleration and top speed. It was evident that something had to be done to overcome the lack of appeal caused by poor performance. There was no possibility of improving the aerodynamics as this would have been costly and EX 182 (codename for the MGA project) was already well advanced for launch in 1955. The only practical solution was to give the car more power, and although thought was given to lightening the chassis and utilising aluminium panels to improve the power to weight ratio, this was rejected on cost grounds. Late in the summer of 1954, a new 1466 cc engine was introduced to the TF designated XPEG. It was in the main very similar to its predecessor the XPAG TF. Siamesing of the cylinders allowed a larger bore in the same block and with larger pistons, stronger con rods and an increase in the compression ratio to 8.3:1, the new engine produced a meaningful 63 bhp which equated to a 10.5% increase in power. Externally there were no visual clues other than engine numbers to distinguish the two power units and there was little on the car to give away its identity as a TF 1500, other than two discreet 'TF 1500' motifs on each of the bonnet side panels and the addition of two rear reflectors. The larger power unit did give the TF a boost in sales mainly in the United States and out of the 3,400 TF 1500's produced, only a handful were sold in the UK. It is well known that Abingdon would rather not have produced the TF, had the MGA project been given earlier approval, nonetheless the TF, and particularly the 1500 version have become one of the most desirable classic MGs. The fine TF 1500 featured bears chassis number 0251, it is a most interesting car in as much as it is, metaphorically speaking, "the first and the last TF". It is one of two cars built up in the development workshop, with the other car carrying chassis number 0250. Most of the earlier MG models commenced their chassis number sequence with 251 which was intentionally coincident with the factory telephone number, Abingdon 251. This tradition was interrupted when chassis number 501 was assigned to the first production run TF. Bore & Stroke: 72mm x 90mm. Max power: 63 bhp at 5,000 rpm. Max torque: 76 Ibft at 3,000 rpm. Carburation: Twin semi-downdraught constant vacuum SU HS4's. Gearbox: Four speed manual with synchromesh on 2,3 and 4. Track: front; 3’ 11.4" rear; 4' 2". Suspension: front; independent wishbone and coil, rear; half elliptic springs with live axle. Performance: 0-60 mph 16.3 secs.